The record for the world’s tallest tilt-up panel was shattered in November when Woodland Construction Co. of Jupiter, Fla. erected a 111-foot 9-inch tall panel. 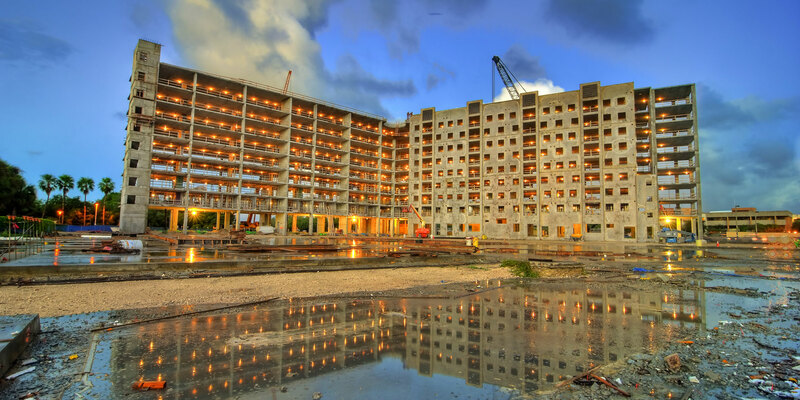 The record-breaking panel forms part of a nine-story, 600-bed dormitory for Florida International University at their Biscayne Bay Campus located in North Miami, Fla.
“I think it shows another example of successful multistory panel construction that is a departure from the normal industry thinking,” said Mark Johnson, PE, ESCB of Johnson Structural Group, Inc. who served as the project’s structural engineer. The lifting design, completed by Scott Collins, PE, Engineering Manager for Meadow Burke, incorporated an eight high by two wide rigging pattern. Bracing was not required as the setting of the panel was performed after all the floors had been placed. “Bracing a panel of this height would not be possible using conventional braces,” said Collins. This approach allowed panel-to-floor connections to be made before releasing the crane. However, this did necessitate a transfer of rigging to additional plumb-setting lift inserts near the top of the panel. The extremely tall panels, of which there are a total of 16, mark the living rooms for the dorms. To accentuate the 13-foot 2-inch wide panels, the thickness was increased to 16 inches, yet the total weight of each panel, which ranges from 134,000 to 146,000 pounds, remained quite manageable thanks to the large percentage of openings. “It’s a great example of a designer who understands the system using its strengths to accomplish a look,” said Johnson. While the weight of each panel was not excessive compared to the typical tilt-up panel, the height of the panel presented several challenges with regard to lifting. “The main challenge when reaching these heights is the added boom length and steep angle greatly reduce the crane’s capacity,” said Gary Fischer, President of Woodland Construction Co. “For example, the 146,000-pound panel with an added 30,000 pounds of rigging put us at the limit with a minimum boom requirement of 230 feet. 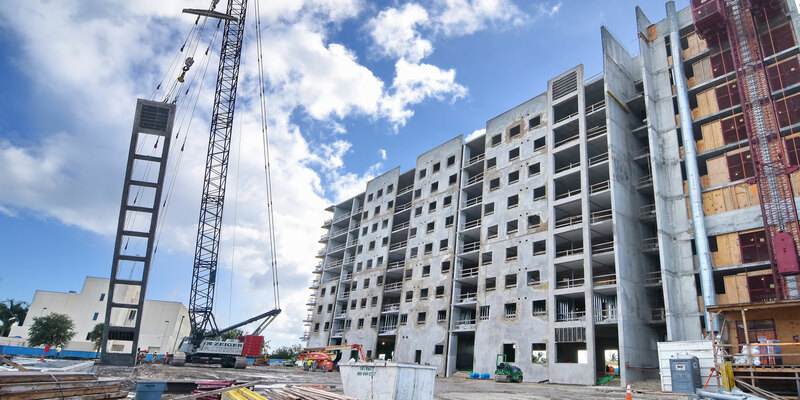 The crane’s capacity with 230 feet of boom is 187,000 pounds at a 40-foot radius, where a typical boom length of 160 feet gives us a capacity of 234,000 pounds.” Detailed lift analysis and Critical Lift Plans were completed prior to erection to ensure accuracy. 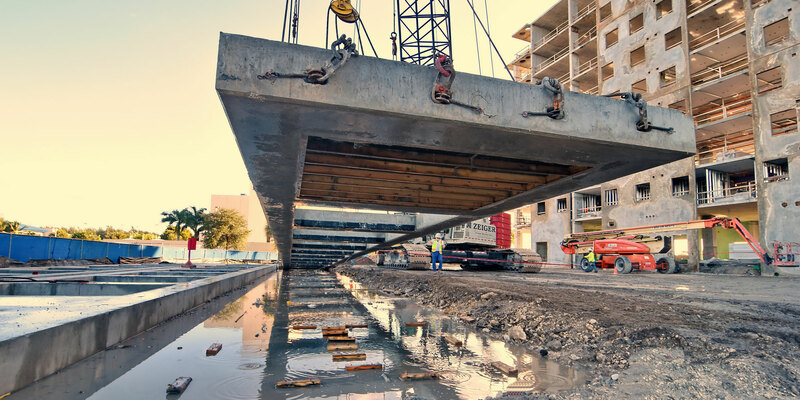 The tilt-up portion of the job should be completed by January 1, 2016.